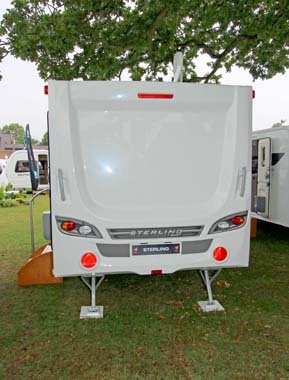 The Sterling Eccles SE Topaz made by Swift, is a two-berth model built using the company’s new SMART technology. 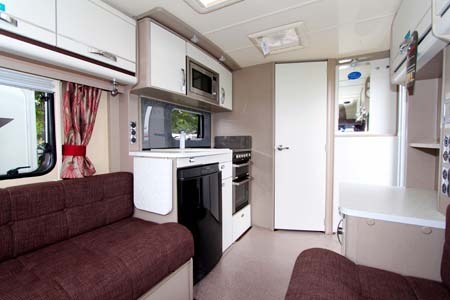 Although considered a mid-range caravan, its interior design is far from middle-of-the-road. 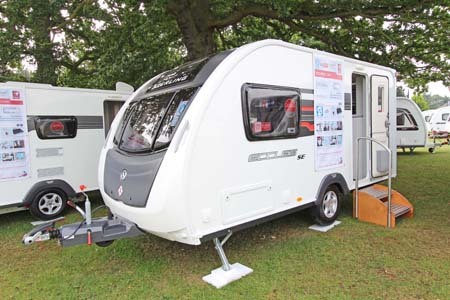 The company states that SMART is based on proven technology and provides a strong timber-less body frame with modern desirable looks and a leading aerodynamic shape that is resilient to moisture, all wrapped up in a caravan that has undergone the most comprehensive testing. The new strong timber-less body frame uses ‘PURe’, a tough hard polyurethane based product that is totally impervious to water and has been proven through use. 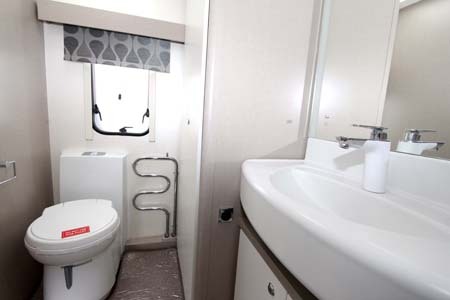 The construction method prevents the transfer of moisture from the 5000 Series marine grade aluminium sidewalls to the wall board inside, making the caravan highly resilient to moisture. The interior design and colour scheme is one that belongs with modern living; think of a modern apartment. Lots of white lockers with chunky, funky chrome handles, white patterned work tops in the kitchen with a practical, space maximising work top extension, contrasted with black to the hob, grill, oven and fridge fronts. Add a white and chrome tap with a granite effect sink and an abstract, LED backlit geometric pattern grey and white splash back; well, you’ve got the message. The message is loud and clear in the shower room with a twisty, curvy, chrome heated towel rail, and an Ecocamel water saving shower head, a white and chrome tap at the basin, a white wardrobe and a cupboard under the basin. The upholstery is brown, hessian effect, but with an iridescent fleck of bronze, decadent, bold red and grey curtains, and a long pile shaggy sparkly scatter rug. It’s fair to say that if you want to err on the side of caution, then there is an alternative fabric option, but why bother? The parallel seating converts into a 6ft 8ins x 5ft 9 ins double bed and there is good access to the under bed lockers. TV addicts have a choice of two places for the television, either by the chest of drawers or on the dresser opposite the kitchen, if you’re not using your iPad. LED energy efficient lighting is under the kitchen work tops, and for task lights; there are low level night lights, other energy saving measure is the 40W roof mounted solar panel. An LCD touch screen control panel controls the Alde heating and hot water system. On the exterior, the graphics are more subtle than you’d expect compared with the interior and there is a BBQ point and a 230V socket. It’s built on an AL-KO chassis and has an Al-KO Secure receiver, Al-KO stabiliser, Al-KO ATC trailer control system, a Thatcham approved tracker retriever system and a passive infra-red alarm system. All that’s missing, security wise is the Al-KO Secure wheel lock and you may want to ask your dealer to fit one as an optional extra security system; your insurance company may suggest that you do so. 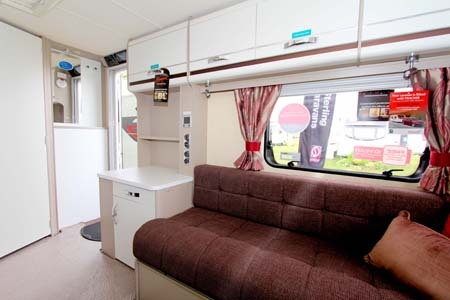 It’s a bold, trendy interior, ideal for those who think traditional style caravan interiors are so last century; we liked it! 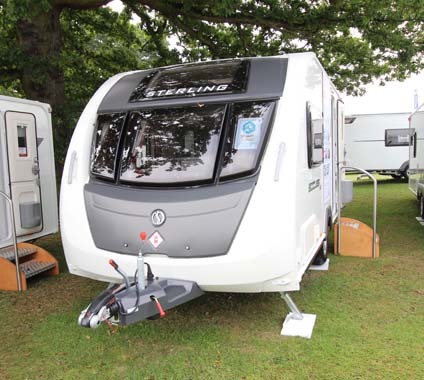 **Price is ex-works and includes VAT @ 20% but excludes a recommended retailer delivery charge of £545.0 including VAT which includes delivery and preparing your caravan for collection by you. Yes the plan looks ok but why is it nearly all caravans give so much space for the wash room/toilet/shower/ area? – In my opinion the toilet needs to be beside the sink not the wardrobe & the wardrobe needs to be where the toilet is/ perhaps it is to do with insulation? — We have a 2007 Lunar 524 & it gives us plenty of room in the toilet area- to me anything more is a waste of space. It’s awful, it looks cheap and will date very quickly. It’s very clinical looking and will be a nightmare to keep clean. The bathroom sink is unusable, its far too small. Not for me. Would love to upgrade our current van, but want one with a gas heater as we do a lot of rallying. New vans don’t have them, why? hate the décor! I don’t think it looks trendy at all – it looks cheap [ think IKEA!] The colour scheme also is uninspiring. I still haven’t found anything as nice as our 2006 Sterling Eccles Onyx – and I’d love to upgrade to a new van. 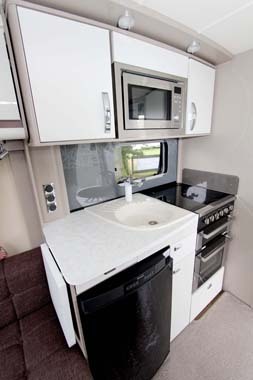 Very nice, but a bit to expensive for a two berth caravan. 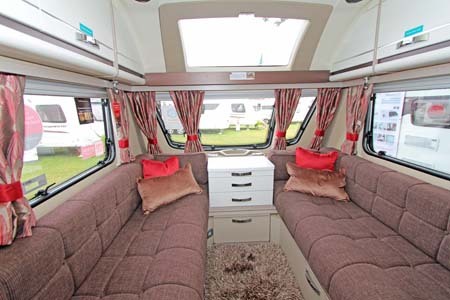 This caravan is definitely on my wish list.